In the much-anticipated follow-up to Sunday Times bestseller Trapped, foster carer Rosie Lewis tells the heartbreaking true story of 13-year-old Zadie. When the young teenage girl runs away from home and is discovered hiding on the city streets by the police, it is clear that all is not as it should be. Taught to believe that Westerners should not be trusted, when Zadie is initially delivered into the experienced hands of foster carer Rosie she is polite and well-behaved, but understandably suspicious of the family around her. 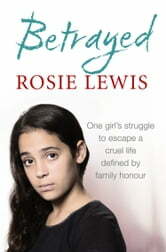 Through Rosie’s support and understanding, gradually Zadie begins to settle into her new surroundings, but loyalty to her relatives, and fear of bringing shame on those around her, prevents her from confessing the horrifying truth about her troubled past. When the shocking truth finally emerges, Rosie and her family can hardly believe that Zadie had managed to keep the shocking secrets to herself for so long. A book i couldnt put down. Hard to believe a family could treat one of their own the way they did. A beautiful outcome though!! Moving.... get some tissues handy. It never fails to shock me what abuse some children have to suffer at the hands of those who profess to love them. Zadie is such a courageous and inspirational young woman. This story had me sobbing on a number of occasions. Only thing I didn't like was that I already knew some of the facts from having read Megan's story and it being included in that.